I stumbled upon your blog from following a link on Pinterest, which led to a different blog, which had a link to your blog. I love your work! I am very new to pysanky, and just really learned how to do it this past fall. I’ve only had the chance to make 3-4 eggs so far, and of course they are not all that great, but I am still learning. I really enjoy pysanky and find it quite relaxing. 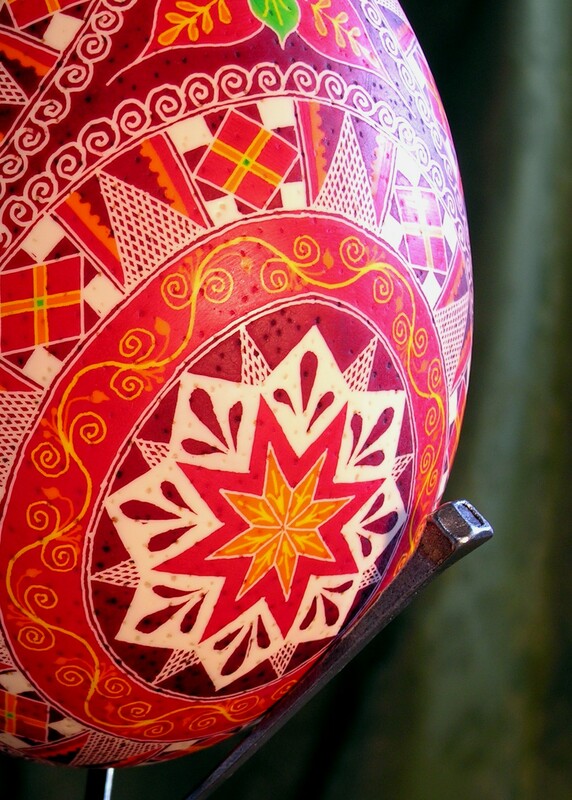 I am on Spring Break right now, and about to sit down and create some more pysanky today. I will be back to visit again! Don’t you love how those rabbit trails lead to unexpected surprises? Glad you found me and my eggs and I’m glad you are learning the art of pysanky too. It’s such a quiet, contemplative art for me and I find I really need that in the midst of the busyness of life. Be sure to take photos of your eggs so you can watch your progress over the years. It’s amazing what a little practice and patience will yield. Have fun! Teresa, I stumbled across your blog while on Google images looking for inspiration in my own egg designs. I am so happy to have found you. Your eggs are exquisite. It will be fun to read your blogs as well. Hi Karen, thanks for your kind words. I think it’s good for artists to connect and to inspire each other. What type of eggs do you do? I’d love to see some of your work. I sent you a bunch of questions a few minutes ago ( different picture, I changed my FB picture over the weekend). I would love to show you some of my egg pictures, how can I do that? Do you have another email that I can send pictures to you, or is there a place here for me to upload? I look forward to meeting them (and you) as well. Thanks for your kind words. I enjoyed looking at your fantastic, intricately designed eggs. I hope that my adult Crafts students are able to meet up with you, and see your egg exhibit, as we talked about on the phone today. Thank you for helping us out. Congratulations on your art show.